Amidst the rising backlash to Gov. Michael J. Dunleavy’s proposal to cut $20 million in already-approved school funding out of the current budget year, the state’s budget director Donna Arduin told the Senate Finance Committee on Tuesday that schools were mistaken to use the money while crafting their budgets. “It is my contention that school districts and other entities seeking money or expecting money from the state should not be anticipating spending money that has not been allocated to them,” she said. The money had been appropriated by the Legislature, but not yet allocated and therefore fell into the crosshairs of the governor’s proposed cuts that were rolled out on Monday, Arduin explained. The $20 million was set to be paid out in late January or early February, budget director Lacey Sanders told the committee. Districts create their budgets based on the anticipation of funding from the state. Even the state’s normal school funding is paid out in chunks throughout the year. The assertion came after Arduin acknowledged that school districts had not been contacted in any way about the proposed cuts, which would still need the approval of the Alaska Legislature to go into effect. If she had contacted them, she would have learned that districts had already built the money into their annual budgets by hiring back teachers, approving salary increases or a whole host of other purposes after years of flat funding by the Legislature. Legislators from both parties were not shy in hiding their disapproval of the process. The Anchorage School District hired 25 teachers and partially funded a labor contract settlement. The Mat-Su School District put the money into teacher salaries. The Kenai Peninsula Borough School District used the $1.4 million it expected to receive to fund 11.5 full-time equivalent teaching positions in this year’s budget. The money was part of last year’s budget negotiations and was to be doled out to districts according to the state’s education funding formula. If the cuts are approved, every single school district in Alaska would be hit with cuts ranging from $5.7 million meant for the Anchorage School District’s 48,700 students down to $7,606 for the 13-student Pelican School District. And when asked about the fate of another $30 million that was slated to go out to districts in the upcoming fiscal year, Arduin said the Senate would have to wait for the governor’s budget on Feb. 13 to find out. 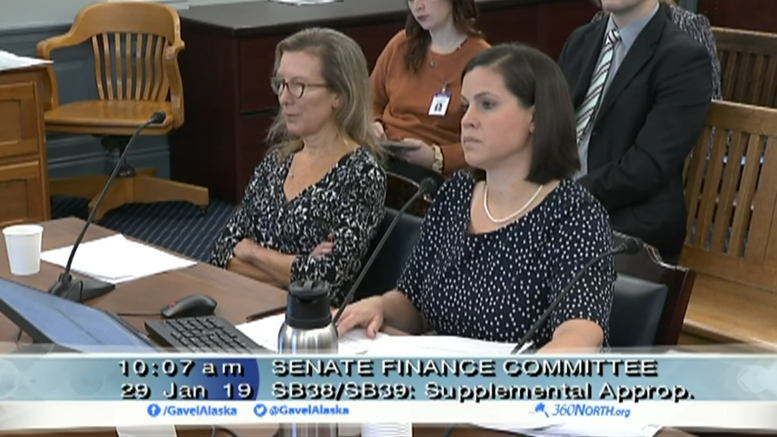 For a budget director who’s already drawn criticism for her lack of connections to Alaska, Arduin’s comments reveal a failure to understand how Alaska’s budget process works. When local municipalities build each year’s budget the amount of money coming from the state is a huge factor, affecting the rest of the budget and the local tax rates. At the very least, Arduin’s claim that districts cannot count on money—even if it’s budgeted by the Legislature—until it’s in their hands amounts to a wild departure from how Alaska’s budgeting has worked in the past, effectively yanking the carpet out from under every school district in Alaska and leaving multi-million dollar budget gaps in the remaining five months of the current fiscal year. The move, if approved, would also strain the already-strained relationship between the state and local municipalities, which have been forced to shoulder an increasing share of school funding as state funding has flatlined. The $20 million approved last year was widely acknowledged as insufficient when factoring inflation and other fixed costs, but still welcomed as better than nothing. Without this money, districts would be left with impossible decisions on how to balance out their budget for the remaining year. It might help the state get close to Dunleavy’s mission of “matching expenditures to revenues,” but it leaves local municipalities holding the bag: deciding between more cuts to schools or another hike for local taxpayers, which isn’t an option for some communities that are already up against the cap on local education contributions. For a governor who touted his background as an educator all along the campaign trail, you’d have to wonder just how Northwest Arctic School District Superintendent Mike Dunleavy—who’d be facing a $547,548 cut—would be feeling about Gov. Michael J. Dunleavy’s proposal. This new blindsiding of educators—the idea that past commitments can be erased mid-year—comes as Gov. Michael J. Dunleavy also happens to be asking the Legislature to commit to pay back dividends over the next three years. 2 Comments on "Dunleavy’s budget director claims schools were wrong to count on $20 million approved by the Legislature"
When we had high student enrollment they hired more teachers—-now our student enrollment is way down!! Haven’t noticed cuts in teachers. Why in the hell have teachers become the bad guys? First of all your comment is completely baseless, teachers have been cut, schools don’t just keep extra teachers. Such ignorant and arrogant attitudes are not productive. Teachers are not a problem they are incredibly valuable, hardworking, sacrificing individuals, who don’t need to be political pawns.